Betty Sue is 46 days into training and starting some low pole work. Pretty fancy footwork for a youngster, eh? She was asked and did two lead changes today as well. Long ago, back in 2004, a horse came into the equine rescue they called Mac. 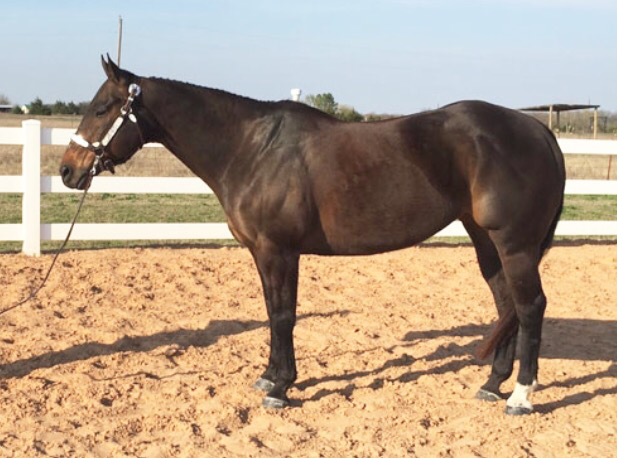 A 16.1 HH quarter horse that did Hunters. I didn’t know who I was going to buy him for but I knew I had to buy him. One of Lauren’s friends named Desi went in half on him. We used him occasionally. Desi won multiple, multiple championships on him.. Then when her family had to go overseas she sold her half again to another girl name Elizabeth who went on to win again multiple, multiple championships. He was the kind a horse most anyone to get on and put in a good ride. He was that kind a horse. I have not before nor since had a horse quite like that. And I’ve kept him on my mind all these years. Watching, waiting and hoping that another one like Mac might show up. 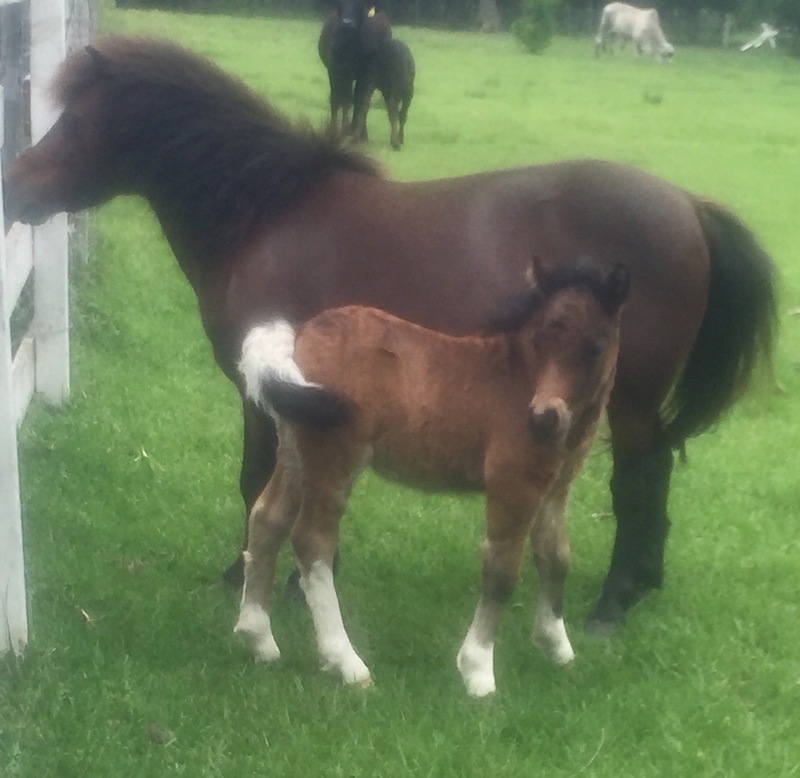 And while I’m sure Mac himself did not show up in the body of this little mare as he is still alive and well at Whipple Tree Farm, this little mare has a lot of his good qualities. Jordyn getting in the first ride. Facebook is covered with horse sale ads. Rarely do I have the money for the good ones that I would like to have. I didn’t really have money for this one either. But this time it seemed important to try to find the money and find the horse, the special horse that we’ve been looking for for so long. I feel it is bad to have a riding barn where there’s never a horse the average person could ride. They’re either too old, lame, too fast, or too dumb, never just right. I wanted the just right horse. It was to be my grandkids horse -all of their’s. Interestingly, the horse’s registered name is “Daddy’s Last Dollar”. Might as well of been “Granny’s Last Dollar”. After some soul-searching and checking my plan against some of my most difficult critics, Tim, Gaylyn, and Lynn, I got a nod from each one of them for their part in the getting the grandkid horse scheme. All that was left was beating out the four other people yesterday alone that were interested in buying the horse and getting up north of Dallas five hours away prior to any of them arriving at 8:30 in the morning with our horse trailer. Thank you, Ally and Lauren, I could not have made the trip. My back would’ve revolutef and I would be laying on the side of the road. Thank you for making the ten hour trek. This morning with the wind high and the temperature low Jordyn got the first ride of the grandkids on the new mare. She absolutely, was as advertised. Jordyn had a great ride -best on any horse ever. That alone made a pretty worthwhile. Cantering quietly at 45 days under saddle. Slow motion trot. Oh my! That Lauren was in the ring with Betty Sue and the two of them are coming along fabulously added to help make this mornIng into one of the top ones of my life. Thanks as always for riding along. Sims is not the biggest yearling in Texas! 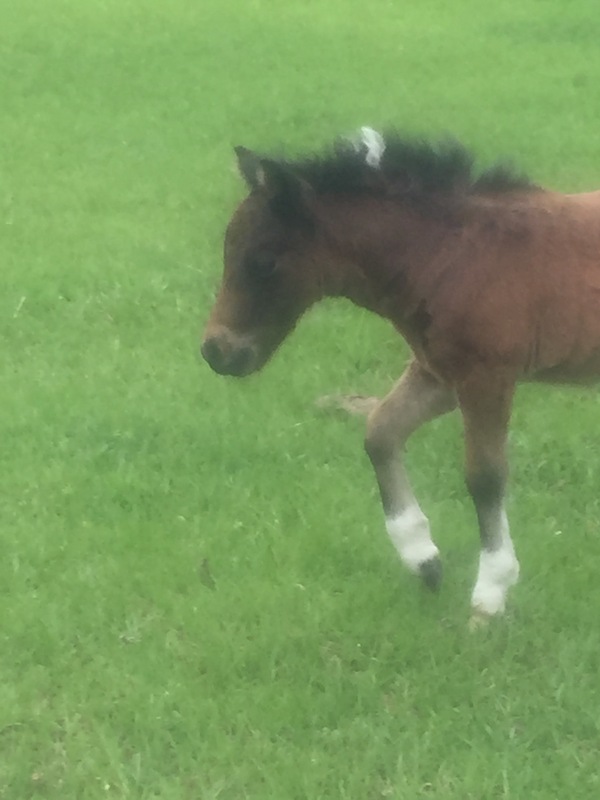 If I had a dollar for every time I have uttered that my baby (soon to be one year old) Sims was a big colt, I might be able to take a cruise out of Galveston. Not rich, but better off. And for you all, you would probably be way less bored if I had not mentioned the colt as much as I had. But…anyway let’s say I was intrigued to learn a friend of mine said on Facebook that she was celebrating her yearling’s birthday and that he was almost 16 hands. Whoa!! That got my attention. Due to the short nature of most of my horses, this yearling Maria had, was taller than any horse in my barn, except my mare Nova. I had to see this for myself. I wasn’t sure anyone else could accurately measure a horse but me. 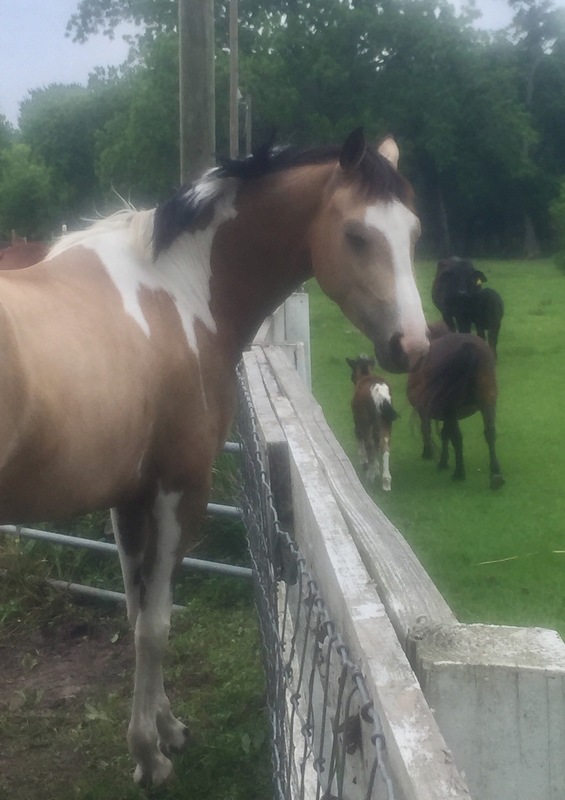 A 16 hand yearling-that was not a major draft breed (for you non-horse people think not a Budweiser Clydesdale or like) was almost unsettling. This horse of Maria’s was German warmblood, American thoroughbred and Shire (which is a draft breed but only a small percentage incomparison to the other bloodlines). My Sims is big. He will be 11 months in a couple of days. He is almost 15.1 hands high at the hip. He will probably be a 17 hand horse which if you ever have seen a five foot man versus a seven foot man, run hurdles, you get the advantage Sims will have over a smaller horse. Sims should have the legs to jump. I met Maria maybe ten years ago at a schooling show I was working and she was showing her eventer. She is a tall, beautiful Danish women. 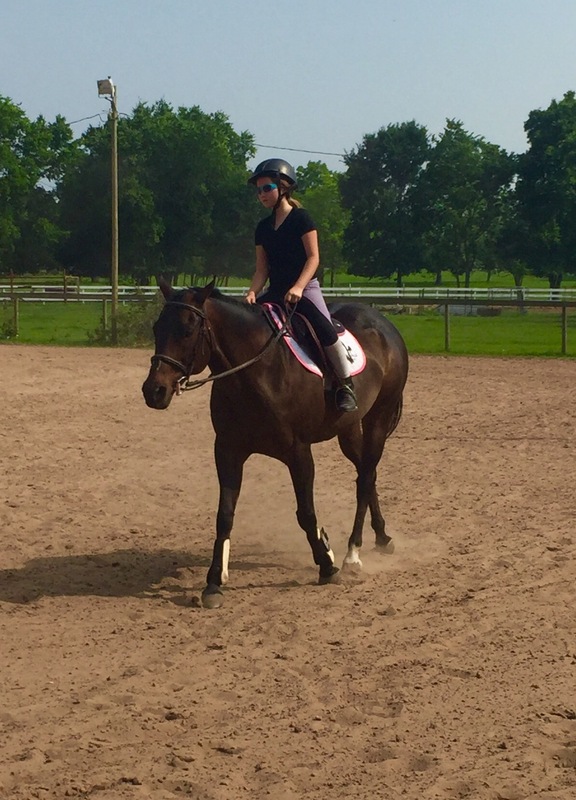 Maria embodies a strong equestrian flair to her life and style. 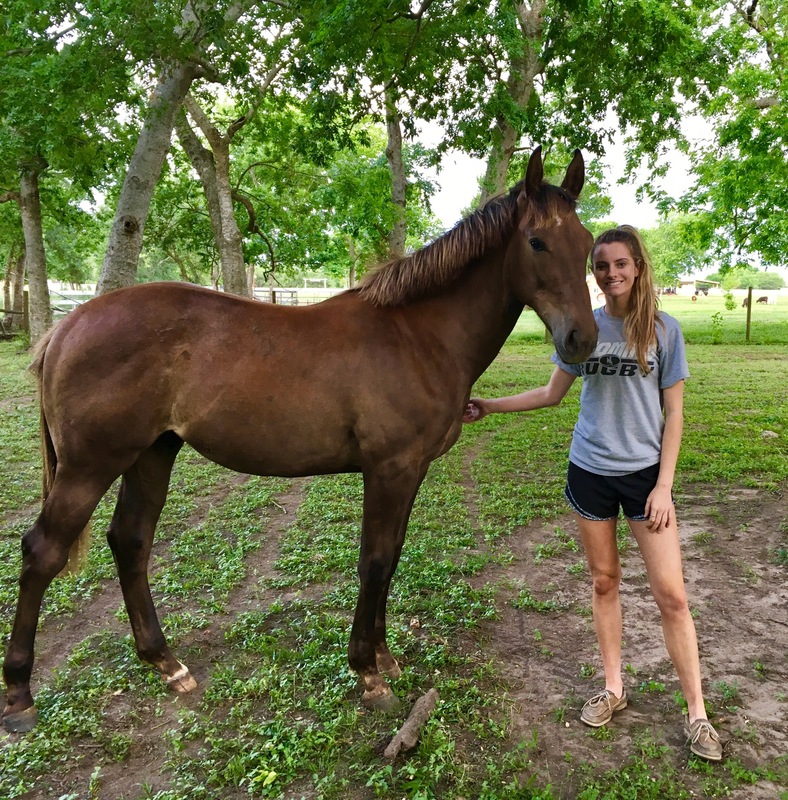 Maria and I have friends in common, but our biggest link is breeder Stephanie Wendorf from whom Maria has leased mares and produced amazing babies. Stephanie, being the same breeder that brought me Betty Sue and Fargo, now through Fargo -Sims, and soon a baby to be born in Colorado, from jumper Flexible. I decided to buy a bit for Betty Sue from one Maria had for sale and headed over to her nearby home with Lauren. I was checking out this baby for myself. I even made sure we could see the babies while we were there. New baby hanging with the big guy. Okay, hands down, biggest Sporthorse yearling I had ever seen and NO question that he was way bigger than Sims. 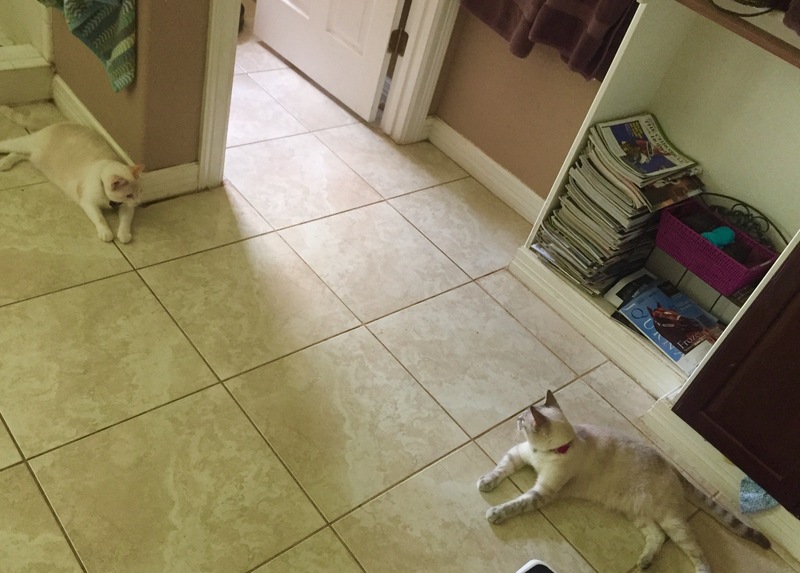 Even given their two months or so difference in age. 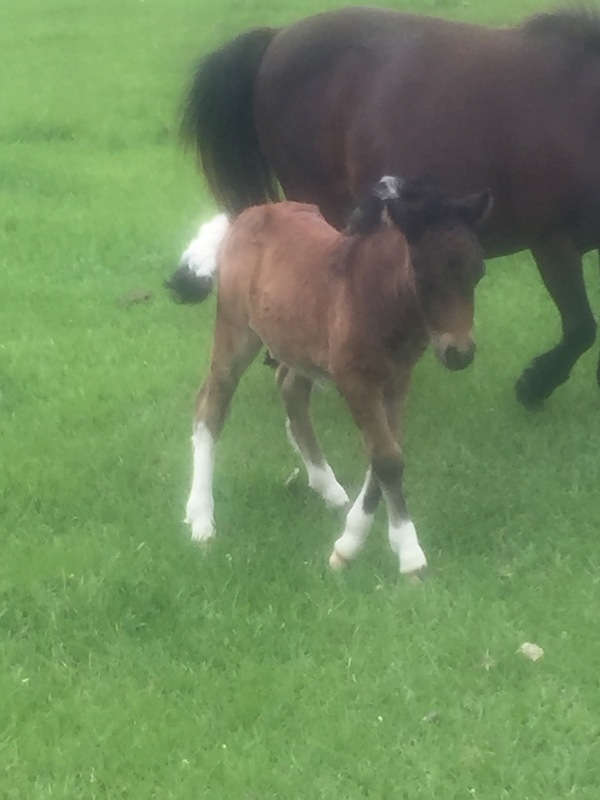 Meet, Mohican DF, by Mitril out of Mirage by Hideway Pond William, affectionately known as Moses. He is buckskin with three white socks. 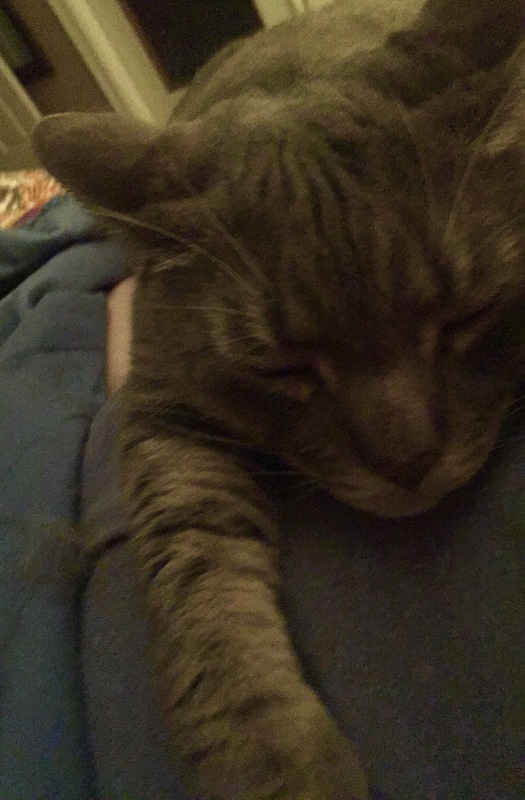 Moses is goofy, unaware of his size, far more coordinated than he should be and so loving. I told Maria early on in our discussion that this story might surface someone interested in buying this amazing animal. Maria, who I have to say often sells all kinds of things, did not even entertain me, she just said no. 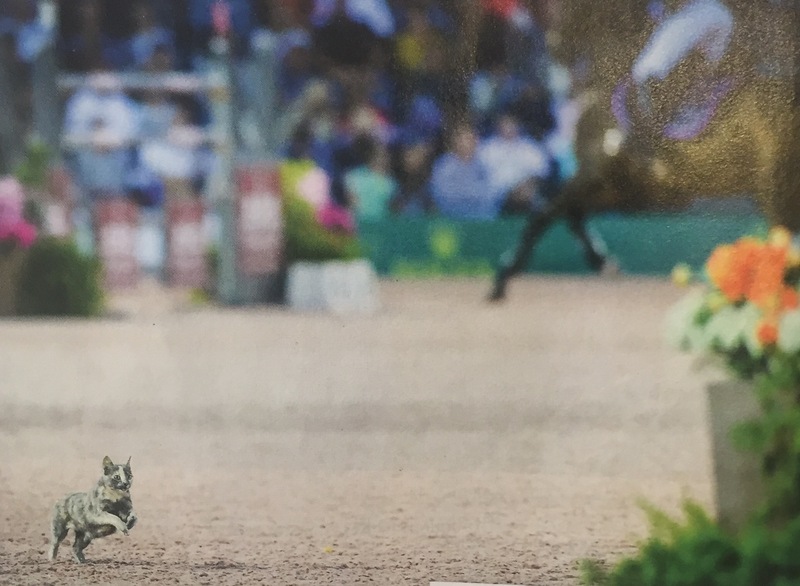 This is her horse of a lifetime. Maria is good friends with Megan, our lady who owned the pregnant donkey (that had the super cute baby) (wouldn’t you want to be known as the pregnant donkey mom?). Anyway, Megan had an enormous warmblood named Maximus. Moses is actually the nephew of Maximus. Maximus topped out at 18 hands and a solid 1800 pounds. Again, for a rule of thumb, my Bruno was a big guy (many photos on this blog will attest to his size) but he was 17.1 and 1450 pounds. A fun comparison of the uncle and nephew at the same age are startling similar. Uncle Maximus on the top with nephew Moses on the bottom. Age maybe two months-talk about big bone with size! Part of what was captivating about this yearling (I have to keep saying that as it is so amazing) was just his bone size. His front legs are long, straight and like tree trunks firmly planted with deep roots. The other thing is just his attitude. 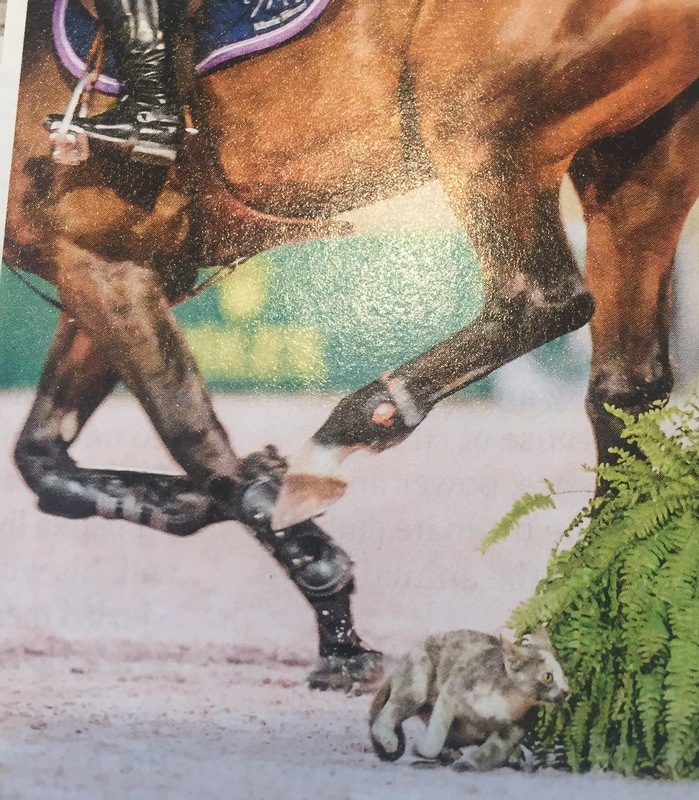 One friend had a show mare named “Attitude is Everything”. This guy is so willing, so friendly and so interested that he will go far. I will not say he has a a better attitude than Sims (got to keep some advantage) but they both have that asset. 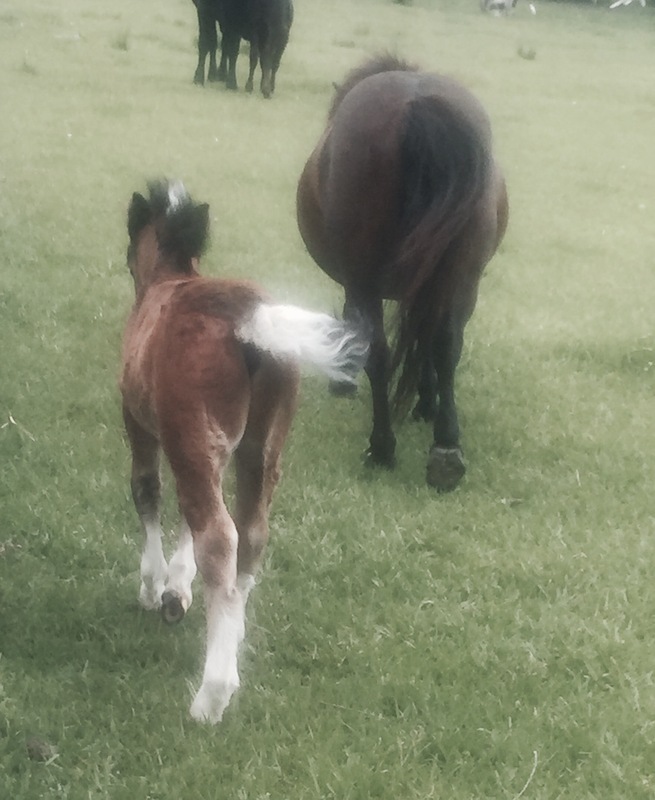 In the pictures above you can see how cares little about if he is faced with a new foal or a mini pony. I asked Maria to get some shots of herself with her boy, Moses. I love the results. Like all good equestrians, Maria, was already in her pjs before the sun went down but was happy to head back out to the barn for a little photo shoot with her main man (is a one year old a man?). That could be a whole different blog. In the meantime, congrats Maria on your fine, young guy. May he be all you hope him to be! And I will shut up (at least until Sims next birthday) about my big boy as he clearly is not the big man of Texas or even Richmond, Texas. Move over Sims, Moses is the king! Maria is 5’10” folks! And I love this picture! 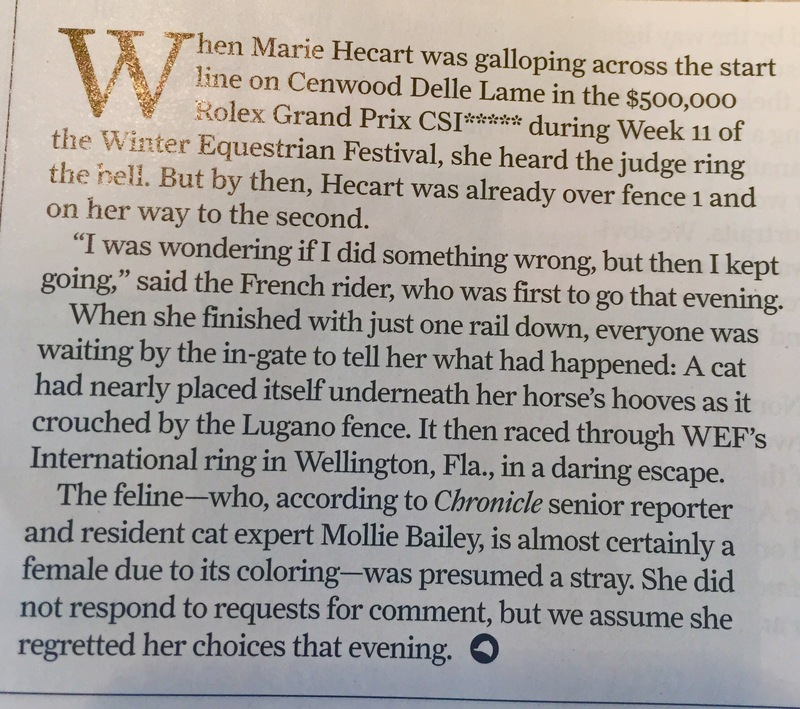 Story courtesy of Chronicle of the Horse. Great story tomorrow. I thought Sims was a big yearling wait until I saw this. Spoiler alert – he’s amazing!